Miami Beach’s first adaptive and inclusive playground opened today at Allison Park. In addition to the ADA accessible playground at 6500 Collins Avenue, the park includes a new tailored dune crossing to provide beach access for everyone. The project was championed by Sabrina Cohen and the Sabrina Cohen Foundation. Cohen, a native of Miami Beach, sustained a serious spinal cord injury in a car accident in 1992 when she was 14. She started her foundation in 2006 focusing on funding research and then later expanded it to include adaptive fitness and recreational quality of life initiatives for people living with spinal cord injuries and other disabilities. The opening was delayed while the City replaced the original mulch ground covering after residents complained it was being used by community cats as a litter box as well as concerns it was not wheelchair friendly. The park now has a rubberized mat surface. 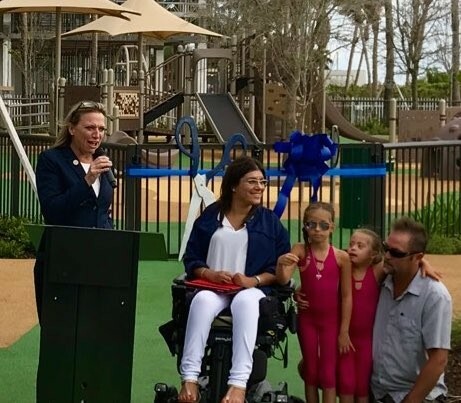 She concluded the City has a lot to be proud of and thankful for as other cities are now looking to us as a model for accessible recreational facilities and beach access. David Martinez, Director of Capital Improvement Projects for the City said of the park, “It definitely was a labor of love [for my team]” noting “a few challenges, a few changes, a little storm at the end”. 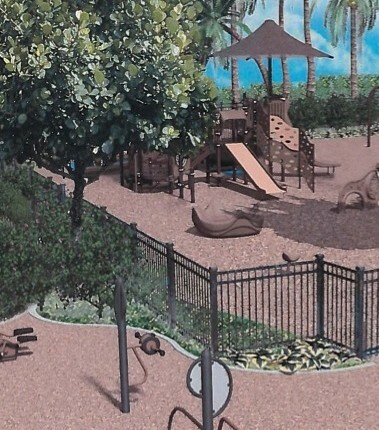 Martinez said with the nearby beachwalk construction, 15 trees will be relocated from the beachwalk into the park which includes 13 play structures in the enclosed playground area and 9 additional fitness activity stations in the general park area. In honor of Cohen, the playground will be known as Sabrina’s Playground.